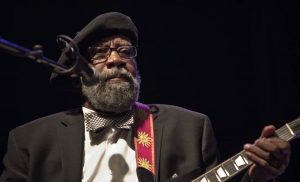 Bill Sims Jr. (June 23, 1949 – February 2, 2019) was an American blues musician. He was born and grew up in Marion, Ohio, United States, and began playing piano at the age of four. At age 14, he turned professional and joined the rhythm and blues band the Jacksonian Blues, which he left to attend Ohio State University. In 1971, Sims joined another rhythm and blues group, the doo-wop-influenced Four Mints. He left the band in 1976 to form The Lamorians, an avant-garde jazz band influenced by traditional African drumming. In 1988, he returned to the blues, founding Bill Sims and the Cold Blooded Blues Band. He released his debut album, Blues Before Sunrise, in 1992, and in 1999, PBS did a 10-hour documentary on Sims and his interracial family (with Sims’s partner Karen Wilson). Sims released another album to coincide with this broadcast. ^ “Bill Sims Jr. & Mark LaVoie”. Artist Reviews. The Country Blues. 2009. Retrieved May 23, 2011. ^ Bob L. Eagle; Eric S. LeBlanc. “Blues: A Regional Experience”. Books.google.de. p. 83. Retrieved 2015-11-07. ^ Poniewozik, James (September 13, 2011). “Television: Two Colors, One Bond”. TIME Magazine. Time Warner Co. Retrieved May 23, 2011. ^ “In Memoriam – Bill Sims, Jr”. Bluesmagazine.nl. February 2, 2019. Retrieved February 3, 2019. This page was last edited on 3 February 2019, at 22:33 (UTC).